Andres Martorell hails from Uruguay and grew up in a very popular “barrio” from Montevideo. From a very young age he was immersed in a musical atmosphere where lots of performers from Murga and Candombe sang at his family home every weekend. His passion for singing thus began, and he started to perform at the early age of 13. After one of his own songs “Vagabundo” interested the label Obligado Records, he landed his first recording deal and completed “Sotano Blues” in 1998. Two years later, he began his exploration into Latin Music and joined a well known Latin Boy Band. 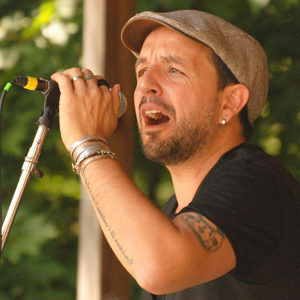 After performing in Carnival 2003, Andres moved to Ireland where he joined the Salsa band, Calle Latina, and has performed with various Latin projects in Ireland ever since. Andres has also performed with some of the most influential names in the international salsa scene, including Alberto Martinez (Marc Anthony’s trumpet player) and legendary singer Evelio Galan (Afro-Cuban All Stars). As a songwriter and publisher, he has written many songs for every band he has performed with and for other artists as well. Andres has trained his voice for nearly two decades and has attended workshops around the world by master teachers (including Maestro Seth Riggs). He is also a certified voice coach himself, and a university voice lecturer in Vocal Technique Studies.